● Unmanned operation for at least 24 hours (but up to 36 hours), accommodating random batch sizes of blades of either material type. ● 100% process tracking and traceability – each blade carries a unique identification code. 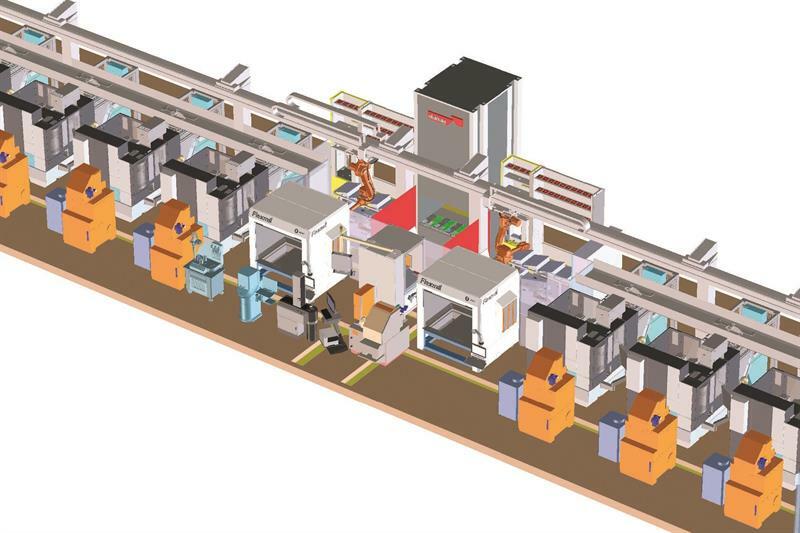 Developed over 18 months, the multi-million-pound FMS comprises a mixture of best-in-class manufacturing technologies from various suppliers; machines brought together and integrated by Starrag (https://is.gd/akakav). The heart of the system is seven Starrag LX 021 machining centres, however, which complete all blade turning and milling, as well as blade threading/parting off. Any blade of any material type can be tackled by any Starrag unit, without operator involvement, achieved via a single datum for every workpiece and using standardised fixturing (designed and built by Starrag). Oversized by only 1-3 mm, forged blade blanks are held in four storage cassettes before an overhead gantry robot picks up a cassette and loads it into the system. The robot selects grippers for handling the fixtures, blanks and finished blades. It places a blank into the first fixture at the set-up station and the fixture is moved into one of the LX 021s where, initially, the blade’s clamping faces (at the end of the shafts) are machined. Then follows an integrated sequence of washing of both workpiece and fixture before the blades are re-chucked for aerofoil and shaft milling and turning. The robot then moves the blades to the polishing and deburring cell where the aerofoil and edges are polished (wet and dry polishing to Ra 0.3 on machines with automatic abrasive belt changers), before fixturing and another clean prior to co-ordinate measurement (CMM), using both tactile (touch-probe) measuring and optical scanning. Finally, each blade is laser marked with a unique code. The fixture and blade are then cleaned again before the blade undergoes thread cutting/cut-off of its clamping faces in an LX 021, to be followed by another clean before returning to the CMM for a second measuring sequence involving blade alignment and orientation. After every individual feature has been measured, each finished part is transported back to the automatic set-up station and replaced into a cassette. The only human involvement in the manufacturing process is the manual loading of the oversized forgings to cassettes that are taken into and removed from the cell via an access portal – plus all tooling is pre-set (using a Zoller [https://is.gd/evacuc] presetter and Balluff [https://is.gd/orihip] chip reader) offline and manually loaded to each of the LX 021’s 90-station toolchangers. All tooling – solid carbide – is Starrag-designed and made. Once in the cell, the entire movement of blades between the individual stations, including inspection, is achieved automatically via two gantry-mounted ABB (https://is.gd/lodebo) six-axis robots. This minimises overall travel times along the 40 m long cell, but also one robot can take over all handling duties, if one unit is out of action. The system is designed so that there cannot be any single source of failure due. Aside from the seven LX 021 machines with a four-pallet buffer station, there are, for instance, two Cellro washing machines, two Flexmill grinding/polishing machines with ABB six-axis robots and two Hexagon-Leitz CMMs (https://is.gd/daguku) with three-pallet buffer. A tower storage magazine holds workpieces, their fixtures and robot grippers, as well as 1,500 blades to support extended unmanned running. In addition, there are two buffer stations for fixtures and two robot gripper stations. 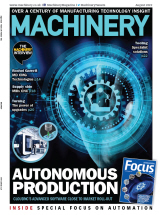 Says Klaus Struebel, Starrag AG’s sales director for Asia Pacific: “If all the machines and gantry robots are considered as the ‘working limbs’ of the FMS, then Starrag’s development of the software that integrates all aspects of the system can fairly be described as its lifeblood. Starrag’s Production Control Software centrally integrates and manages all aspects of FMS operation, as well as the collection and evaluation of production and measurement data for each workpiece. Continues Struebel: “Our customer, an existing user of Starrag machines (including STC machining centres for casings and blisks, for the domestic as well as military aircraft markets, for example) wanted to reduce operator involvement and eliminate potential errors in the manual transfer of blades between machines and processes – and have no idle times. “It also demanded integrated and consistent high quality polishing and deburring (no steps) on the finished blades, as well as full traceability of every part. And it wanted to deal with just one supplier; to have just a single point of contact.